Hauwei yesterday introduced a new quick charging technology at the 56th Battery Symposium in Japan. 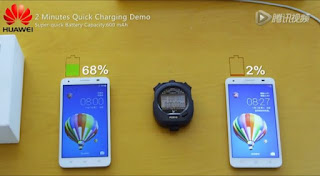 The new quick charging technology demoed by Hauwei's Watt Lab was able to charge a 3000mAh battery from 0% to 48% in 5 minutes and also a 600mAh battery to 68% in an incredible 2 minutes. This puts Hauwei miles ahead of Qualcomm's newest Quick Charging 3.0 which requires at least 30 minutes to the same level of charge. Hauwei was able to achieve such record charging speed by bonding heteroatoms to the molecule of graphite in anode, which could be a catalyst for the capture and transmission of lithium through carbon bonds. Huawei stated that the heteroatoms increase the charging speed of batteries without decreasing energy density or battery life. Hauwei hopes that this breakthrough would revolutionise the industry particularly with our push for electric cars, mobiles, wearables, etc. Allowing users to charge their batteries to full power in the time required to grab a cup of coffee.